CHARLESTOWN, Nevis, Nov 21, CMC –Premier Mark Brantley says an estimated EC$60 million (One EC dollar=US$0.37 cents) is needed to develop the stalled geothermal project on the island. 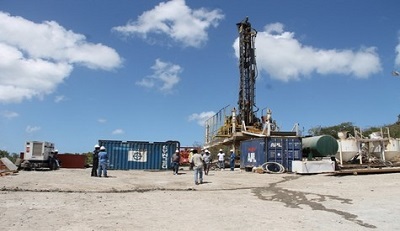 “I think that at this stage all of us know that what we’ve been waiting on is for production of the energy and that would require the necessary investment to drill the production wells and to build the plant and to do tie into the connectivity between the plant and NEVLEC (Nevis Electricity Company Limited) so that NEVLEC can transmit the power,” Brantley told a news conference. He said that is what has proven most difficult because Nevis Island Administration had been able to raise the resources to do the exploration and it’s just for the production. “The developers have had difficulty raising those monies (and) they have brought in recent months Black Rock Securities which they say is going to provide some equity financing and OPIC (Overseas Private Investment Corporation) … which is an arm of the United States government which is supposed to provide some debt financing. “If we had the money we would do it ourselves, to be honest cause then we would only have to hire experts but it would be something that we do as a project but the problem is the funding,’ Brantley said. He told reporters that two sources for financing have been identified but that process might take several months to materialize if at all. “The last that I’ve heard is that OPIC has okayed their side of things to do the financing for the project on the debt side but I’m not sure what the result of the Black Rock due diligence is going to be. “Each of those entities takes between three to six months to do their due diligence and so that process has been an ongoing process. We have had visits from both OPIC and Black Rock Securities I believe they were all here towards the middle of this year and so we await final word,” Brantley said. But he sought to assure citizens that the NIA remains committed to bringing geothermal on stream for the benefit of the people of Nevis and the rest of the twin island-federation. Earlier this year, GeothermEX, a subsidiary of Schlumberger Company that focuses on geothermal energy testing, said its findings confirm the requisite temperature and flow necessary for a sustainable supply of geothermal energy on Nevis and the reservoir has been classified as high-grade commercial quality.